This page describes how the demonstrator software works, and how you can interact with a MIRO in DEMO mode. Related FAQ: Why does my robot sound like a satellite? Whatever you use it for, MIRO behaves better with fresh batteries. If the main battery level drops below a safe level, a low battery alarm will begin to sound. When you hear this sound, you should immediately turn off your MIRO, wait for it to shut down, and put the batteries on charge. Selecting DEMO mode actually just enables a very small stub of code built into MIRO that serves as a simple decision-maker, as well as initialising the Biomimetic Core. The behaviour you'll see in DEMO mode, then, is really just a reflection of the normal operation of the Biomimetic Core. The core is, amongst other things, computing a model of multi-sensory attention in the mammalian brain. Therefore, to really understand MIRO's behaviour in DEMO mode, you'll need to explore the details of that model, but we'll quickly walk through its components here. MIRO's core demonstrator behaviour is to respond to stimuli in his environment that he finds to be salient. In this instance, that means moving things, things that make loud noises, and people that touch him. Meanwhile, he is running a mood model that has components of valence (positive/negative) and arousal (excited/relaxed). Depending on where MIRO is in this mood space will affect how he responds to those salient stimuli. You can most easily uncover MIRO's mood by watching how he expresses mood through his lights, the vocalisations he makes, and the movements of his eyes and tail. Underneath these "higher-level" systems, MIRO is also running reflex behaviours. If he detects a drop-off in front of either of his wheels, he will immediately stop any forward motion. This reflex reduces his tendency to fall off edges (but it is by no means infallible, so don't count on it!). The basic way to wrangle a MIRO is to make sounds (clap your hands) or move around (wave your hands, or bounce a football in front of him). MIRO will attend to these stimuli by turning his head and, if required, his body. He is not picky, however, so if you want his full attention you will have to be sure there is nothing else nearby that might distract him. If a stimulus stays in much the same place for a little while, and MIRO is in a reasonable mood, he will approach the stimulus. In this way, you can get MIRO to come to you, and thereby follow you, by waving something to get his attention, and by calling him over to you. MIRO is, like any animal, easily spooked. If you get in his face, he may look elsewhere for a calmer situation. Unless he's really on a high, in which case he may just choose to engage. You may need to learn to embrace unpredictability. Immediately after start-up, MIRO is in a neutral mood. His lights will pulse white, and he will be vocalising pleasantly. In this neutral mood he may choose to approach if a stimulus is strong enough, but he may equally choose to stay exactly where he is. Various things will affect MIRO's mood, either positively or negatively. These include the time of day, needing to sleep but being kept awake, human contact, being hit on the nose, the presence of exciting sounds—or of unpleasantly loud sounds; we leave it as an exercise for the reader to determine which make him happy and which make him sad. If MIRO is in a particularly good mood, his lights will be pulsing green, and he will be driven to approach stimuli that he notices. In a particularly bad mood, MIRO's lights will pulse red, and he will tend to run away from things rather than approach them. The character of MIRO's vocalisations will also vary with his mood. Meanwhile, MIRO's breathing rate—and, hence, vocalisation frequency—will vary with his arousal; in a very aroused state, you may even be able to hear MIRO breathing in and out in time with the pulsing of his light arrays. MIRO can't tell the true time of day unless connected to the internet or provided with a clock battery; his clock defaults to noon at switch-on, however, which is a time of day at which he tends to be fairly chirpy. 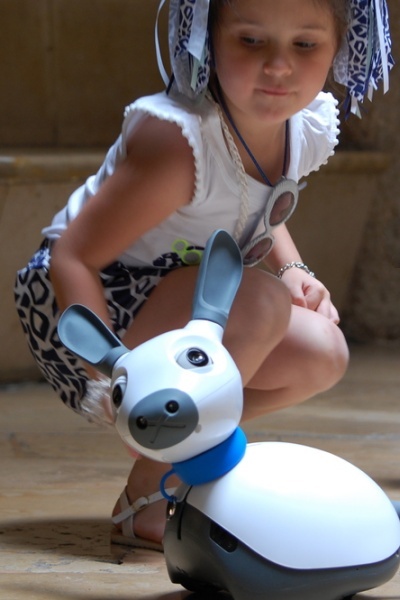 MIRO is a social robot, and his mood is particularly strongly driven by human interaction. He likes any contact on the touch sensors arrayed over the back of his head, and will respond accordingly. Stroking his back is good too, but don't stroke him the wrong way—he doesn't like that at all. He doesn't mind being picked up, but will get a bit shirty (not to mention he might be damaged) if you drop him, so it's best to keep physical abuse to a minimum. After a period of activity, MIRO will become tired and fall asleep. His lights will glow orange as he snoozes, and pulse more slowly in line with his slowed breathing. Only a brief sleep is needed to refresh MIRO, and he will wake up again rather snappily when he's feeling stronger. After waking, you should find him in fairly neutral mood, having largely forgotten whatever you did to him last time he was awake. Depending on the demonstration environment, some of MIRO's behaviour may be undesirable. This is what the Demo Flags, accessible through the MIROapp, are for.